Extra Large Ceramic Beer Mug with Rabbit. Blue Bunny Beer Mug. 9th anniversary Gift. Large Pottery Mug. Handmade Tea cup. Bunny Coffee Cup. Announcement Handmade ceramics in contemporary colors for all home and office decors. All the pottery here is handmade by me in my Colorado studio - either wheel thrown or hand built from slabs and coils. I offer coupons and discounts from time to time through my newsletter every six weeks or so. If you'd like to get on the mailing list, please contact me with your email address and I'll add it! Please know that I don't accept multiple coupon codes and discounts are not available for items that are already marked on sale or for made to order/personalized items. All items except Made to Order ones generally ship within 1-3 business days of your order. I make my own glazes and electric fire my dinnerware, vases, bakeware, etc to Cone 6, making it very durable for everyday use, including in the oven, dishwasher and microwave. I'm always adding new pieces to this collection of handmade pottery so be sure to check back often. "I have no words! This piece is the cats pj's, the cream of the crop, the one and only, top notch and really freakin awesome too! Thank you Deb for your talent, professionalism and kindness." "Holy cats I absolutely love the bowl (and spoon and chop sticks) I ordered! It was a Father's Day gift, but after opening up the box I almost didn't want to give it up! The pics don't do it justice either, the colors in person are absolutely gorgeous. I will likely buy more items from this shop in the future!" "Stunning piece! So much detail and colors are perfect. I will cherish it always." "As usual, Deb shipped my item right away! And as usual, it's beautiful and perfect! My little sugar pot and spoon is on display on my counter and I just love it! My husband says he's worried I have an addiction to buying Deb's pottery! And it's true...."
"Fun, unique piece! Packaged carefully and quickly shipped. 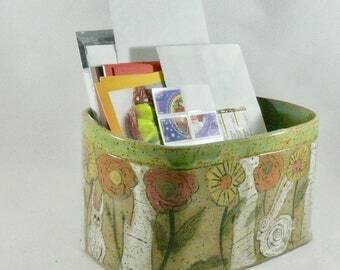 Thank you for including business cards and artist info which is appreciated for gift giving. " "Over the moon to have this fun bowl on our breakfast table. Such a happy piece. Love it! Arrived VERY WELL PACKED. Great service and convos. Thanks. " "Deb sent these items beautifully packed and they arrived on time with no damage. Deb was a joy to deal with during the ordering process. The mugs and matching saucers are an absolute joy with gorgeous colours and a very artistic decoration." 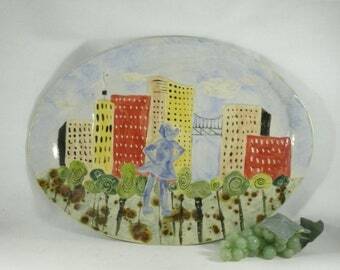 Handmade ceramics in contemporary colors for all home and office decors. All the pottery here is handmade by me in my Colorado studio - either wheel thrown or hand built from slabs and coils. 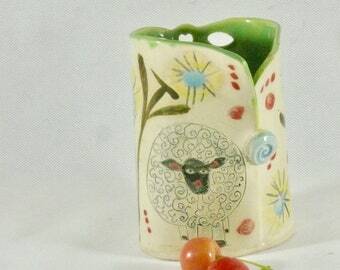 Ceramic Cereal Bowl with Sheep. Pottery Bowl with Ewe. Handmade Colorado Pottery Soup Bowl with Lamb. 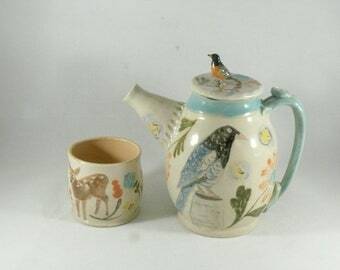 Magpie Ceramic Teapot, Heckle and Jeckle Pottery Tea Set, Tea Pot and Teacups, Collectible Ceramic Art, Pottery Anniversary Gift. 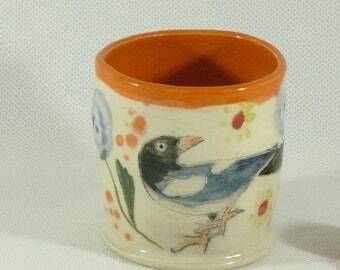 Large Pottery Bowl with Crows and Butterfly. Ceramic Salad Bowl. Kitchen Serving Bowl Fruit Bowl, Mixing Bowl. Ceramics and Pottery. Ceramic Sponge Holder for Kitchen Sink. Scrubby Holder. Drain Bowl for Sponge. Cup for Scrubber. A gift for my niece; she will love it. Appreciate the detail. Planned to give it as a gift but may keep it for myself. I love cats and colorful mugs so this was the perfect choice for me. I adore this little brown cat with his pink nose and wide green eyed stare. He is full of personality. The flower motif going around the mug is delightful. I also love the color variety. It’s very cheerful. Deb’s pottery is always very well made and unique. I own five mugs and four other pieces. Everyone is a delight and a joy to use. This shipped fast and was very well packaged. Deb is lovely and easy to work with. Great customer service. 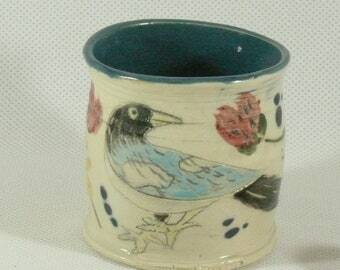 I think she is a terrific artist and I will continue to purchase her charming vibrant pottery. Some new designs for sugar bowls that I am working on today. What do you think? The start of a set of plates for Nancy. More Save the Bees cups, dishes and bowls! I free hand carve my designs onto the clay while it is still soft. About 50% of my work is done on the pottery wheel and the rest is hand built from slabs and coils. Pottery just coming out of the kiln. I work out of a studio that is also an art gallery displaying my work. It's located on the way to the ski mountain. These cups might all look the same but because they were thrown by hand, each one differs slightly from the others. Handmade pottery differs from mass-produced pottery in similar ways that a home-cooked meal differs from a frozen entree out of the grocery store freezer. It is lovingly made in a manner that takes more time, has ingredients in it that the creator has chosen with care, and offers qualities that could never be achieved with something mass-produced. Sometimes it doesn't look as polished or perfect as a manufactured item, but it certainly has soul, and the imperfections give the pieces a certain charm and character. Most handmade pottery is one-of-a-kind since each piece is made individually, one at a time. It has an inviting feel to it that makes you want to touch it, hold it, and enjoy using it. Because it was lovingly made by an individual, it has a positive energy that flows through to the person who chooses it for themselves or another. It also offers qualities that manufactured pottery cannot hope to achieve, such as being created for a very limited use purpose or being personalized with a name, message or a particular size, shape, color, texture or design. Handmade pottery is generally more ecologically friendly than wares that come from far away places, most often overseas, and the individual craftsperson is generally more likely to recycle and reuse materials in the creation of handmade pottery. No waste going to landfills; no chemicals and toxic materials being released into the environment. 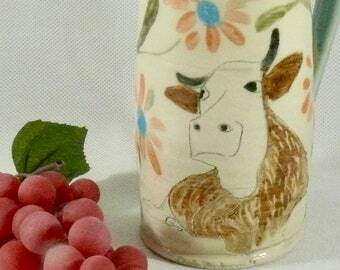 I hope you enjoy browsing my shop and learning more about handmade pottery. Owner, Maker, I Do It All! I'm a studio potter working in porcelain and stoneware clay. Before moving to Colorado and starting in pottery in 2001, I ran a marketing research firm in Michigan for 17 years. Quite the change in professions, huh? Hi! I'm so glad you found my shop among all the wonderful artists on Etsy. When you purchase my handmade pottery, you can be assured that I have created it to the highest standards of safety while retaining the creative, whimsical touch for which my work is known. My glazes are food safe and can be used in the oven, microwave or dishwasher unless the description says otherwise. However, as with any handmade pottery, it will retain its fresh good looks longer with handwashing and limited microwave use. I accept custom orders and will sell wholesale to galleries/shops....please contact me for information. If you don't like it or there is a problem, I will refund your money, replace the item, or even make you a new one. Please let me know if there is a problem within a week of delivery. And, please, before leaving a bad review of my shop or your purchase, please give me a chance to make things right. If you decide to return something simply because you don't like it or have changed your mind, but there was no damage from shipping or a defect, I will refund your money less the cost of shipping once it is returned to me in good shape. Please know that you are responsible for any taxes or duties or customs fees that may be charged on your purchase. The seller and/or etsy cannot know the rules of every country and state. ***A Word About COLOR**** I try very hard to accurately represent my product through photographs and description. I want you to love your pottery and come back for more! A lot of people don't realize that the color of the image can vary widely from one computer monitor to another. What looks lavender on one computer can be gray on another computer etc. If the exact color of the item is very important to you and you are unable to determine the shade through my description, please send me a Convo and I'll give you as much detail about the color as I can. I'm happy to accept payment via PayPal, money order, check or credit card. If you wish to bypass PayPal and just call me with your credit card number, I'm happy to accept that, too. The number is 970-846-9349. When you check out on Etsy, just click the 'Other' button for payment and call me with your credit card information. If you see something that you want but won't have the money until later, I am happy to place an item on hold for one week and will list the item as Reserved for you. If you wish to buy an item over time, that's ok, too. I will accept a 20% deposit on the item and allow you to make payments over time as long as the item is paid in full within two months. If it is not paid in full within 60 days, you will forfeit your deposit since I have lost the opportunity to sell that item while it was on hold. For other special arrangements, please contact me. I generally ship within 1-3 days of receiving payment, and for most items I use UPS Ground or USPS Priority Mail. I use lots of bubble wrap, foam and peanuts for the protection of your pottery. If an order is returned to me or if we cancel an order because of a defect in the pottery or it wasn't as described in the listing, I will refund your entire payment. If it is returned because you have changed your mind or don't like a color, size, shape, etc., I will refund the purchase price of the items upon their return but not shipping charges either way. If something breaks during shipping, I will file a claim with the shipper and refund your money or replace the broken item as long as you document the breakage with photos of the broken pottery, photos of the packing materials I used, and photos of any damage to the outside of the box. The shippers generally require this documentation before paying the claim. On International orders, I've tried my best to estimate the shipping costs. However, if I have overestimated it significantly, I will refund the difference to you. Because USPS is our only viable option for international shipping, I will make every effort to pack your item very carefully but will not be able to process a claim should the package arrive damaged. You will need to work through your local post office to file the claim. I will be happy to provide you with any documentation needed. You are also responsible for knowing and paying the tax, customs and duty charges in your own country or state. Those are not generally collected by etsy. I love a challenge and will accept custom orders if I feel it is something that I can make well for you. I do not share your contact information with anyone but the shipper I use to send you your pottery. Your email address is added to my newsletter list so that you can receive my discount coupons and be notified of sales in my shop, but that address remains confidential and is not sold or given to anyone but the mailing service I use (MailChimp) who has their own policy for protecting privacy. If I feel I can make something custom for you in a style, design and glaze that I have tested and perfected, I'm happy to consider custom and personalized orders. Please know that there is generally an added charge for this and it may take six weeks or more to complete. Because all of my pottery is made one at a time, there will be variations in size, even when you purchase a set of two or more pieces. Generally these are maybe 1/4 to 1/2 inch in difference and a couple ounces in volume at times. I use a very durable stoneware clay for my pottery, making it able to withstand continued, everyday use. 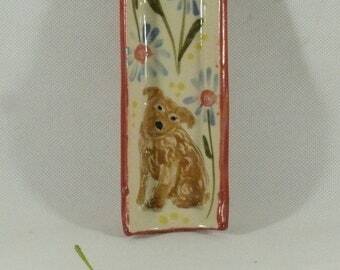 Unless stated otherwise in the description, you can use my pottery in your oven, microwave and dishwasher. It is very difficult to gift wrap your pottery since I need to make sure it has lots of bubblewrap and peanuts surrounding it so it arrives intact. However, I am very happy to tie a ribbon around the packing material and to include a hand written card with a message from you inside the box. Just leave me the wording in your Note to Seller at check out.